Internet Explorer : Temporary files, history, cookies, super cookies, Autocomplete form history, index.date files. Firefox : Temporary files, history, cookies, super cookies, download history, form history. Google Chrome : Temporary files, history, cookies, super cookies, download history, form history. Opera : Temporary files, history, cookies, super cookies, download history. Apple Safari : Temporary files, history, cookies, super cookies, form history. Other Supported Browsers : K-Meleon, Rockmelt, Flock, Google Chrome Canary, Chromium, SeaMonkey, Chrome Plus, SRWare Iron, Pale Moon, Phoenix, Netscape Navigator, Avant and Maxthon. Windows : Recycle Bin, Recents Documents, Temporary Files, Log Files, Clipboard, DNS, cache, Error Reporting, Memory Dumps, Jump List. Registry Cleaner : Advanced features to remove unused and old entries, including File Extensions, ActiveX Controls, ClassiDs, ProgIDs, Uninstallers, Shared DLLs, Fonts, Help Files, Application Paths, Icons, Invalid Shorcuts, and many more. Third-party applicatiions : Removed temp files and recent file list (MRUs) from many apps including Windows Media Player, eMule, Google Toolbar, Microsoft Office, Nero, Adobe Acrobat, winRAR, WinAce, WinZip and many more. 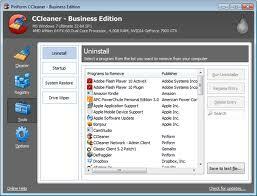 Added cleaning for Internet Explorer Metro Histoty. Improved Firefox compability on v17 and newer. Improved Google Chrome extension compability. btw Ada yang salah tuh. Ko histoty sih!